I have been making jewelry at home to make money. Last week, I got a call to put my stuff in a shop in two days. The only problem was I had used my necklace display stand somewhere else. I didn't have the money or time to buy another. After worrying and not sleeping, I decided to use stuff I had at home to try and make one. I used a $3 vase on my mantel, coat hangers, twine, wire, and hot glue. In the vase I put some rock nuggets to make it heavy so it wouldn't fall over. After cutting the hangers, I used twine that I cut and unwrapped from a basket on the table in front of me, to wrap them in. Hot glue held the twine in place, then I used a small amount of wire to wrap around that. 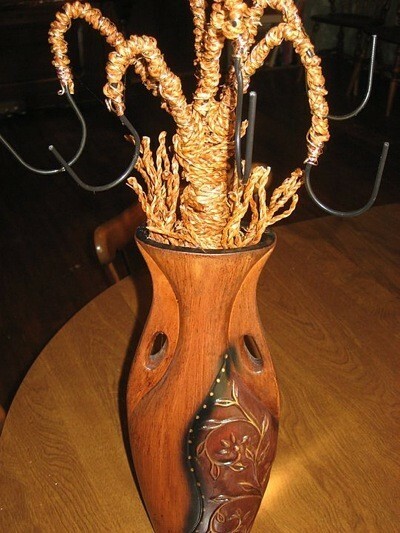 I used hot glue and more twine to hold the wires firmly in the vase. I was so proud when I took the vase in the shop and hung my jewelry from it. Triumph over adversity!